The pitches here are on a south facing bank nearer to the buildings with views to the South Downs or into the neighbouring woods. This area is a closer to the facilities. There are 3 pitches here and it is car and dog free with a campfire on every pitch. Firewood and charcoal are available for sale from reception and we have great shower, toilet and washing up facilities. The Secret Campsite Lewes is one of The Secret Campsites, a collection of Real Camping and Wild Glamping sites focused on nature, peace and space. 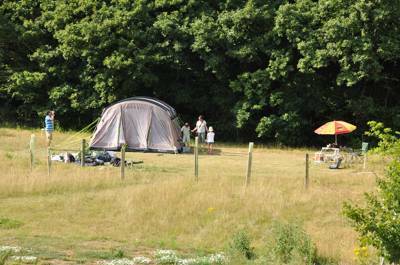 The campsite is a peaceful, tents only campsite for nature lovers, real campers and their families, who are looking to explore Sussex, Brighton or Lewes. Our woodland meadow camping pitches are large and secluded and come with their own camp fire pit and free hot showers. We also have a number of unusual shelters where you can spend the night. By keeping the meadow car and dog free we enable wildlife to flourish, and this increases the number of encounters that you and your family will enjoy. It also ensures that it is a safe place for children to roam freely and explore, and we have an area of woodland where dens can be built and trees climbed. We are located in a beautiful and sparsely populated part of East Sussex, and our camping meadow is enclosed by both private and public nature sites. These include great stands of ancient and coppiced woodland, and a site of nature conservation interest, SNCI. This mosaic of habitats is incredibly rich in wildlife and The Secret Campsite Lewes is lightly managed to create an environment where wildlife can thrive. The surrounding ancient woodland has been encouraged to advance at the edges of the camping meadow, which ensures an ever changing diversity of animals and plants for you to watch, hear, eat, smell and touch. Catch glimpses of deer, hunt for slow worms, wake to the dawn chorus, build dens or simply enjoy the unique flavours of fresh and foraged produce at the end of a busy day. We also have two secret shelters, The Tree Tent and Gridshell. These are both fantastic quirky accommodation options for your stay in our beautiful site. Both of these beautiful shelters have been designed by local inventor and designer Jason Thawley and the Tree Tent was even featured on George Clarke's Amazing Spaces. Camp with us as you relax and explore Sussex, and you’ll leave wanting more. Please note we are a peaceful family site and do not allow groups. Please see our Beech Estate Campsite for group bookings or visit the Wild Boar Wood site for bell tent glamping stays. Campfires allowed. 12 pitches in the main camping meadow and a further 5 on the western side of the site near the showers. 2 of these are amongst the fruit and nut trees making up our disorganised orchard, and the other three are on a south facing bank nearer to the buildings with views to the South Downs or into the neighbouring woods. 3 showers occupy an old stable block along with toilets; compost-loo shacks are nearer the pitches. Trolleys are available to transport your gear to the main meadow. No shop as such, but you can buy firewood at reception. Tents – yes. Caravans, campervans, big groups, young groups, dogs – no. There’s plenty to do in Brighton, 13 miles away, but don’t overlook the delights of Lewes, a pretty market town nestled in the South Downs just 5 miles from the site. There’s a farmer’s market on the first Saturday of the month and an outdoor lido for hotter days. You can walk there from the site – ask at reception for the route. Glyndebourne Opera House is just a few miles away and the South Downs National Park is a 3 mile stroll to Offham. Finally, Middle Farm and Drusillas Park are a great morning out for children which can be combined with walks around the Friston or Ashdown Forests to wear everyone out ready to collapse back at the campsite around a fire to tell stories and play cards. Tim, the owner, knows all the best places to get fresh, local produce, including the Holmansbridge Farm Shop (01273 401964) in Town Littleworth which is a 5 minute walk away. The Royal Oak (01273 400418) is a 20 minute walk away along the dismantled railway line that links the campsite to the village of Barcombe. The Horns Lodge (01273 400422) is a 20 minute walk through Balneath Woods and Markstakes Common and serves great beers and tradfitional pub food. If all country pubs could be as good as The Griffin at Fletchling (01825 722890) with its delightful garden and exceptional food, the world would be a happier place. Lewes is home to the wonderful Buttercup cafe (01273 477664), which is located in a courtyard that it shares with an antiques business, and for the more adventurous Chaula's Indian Restaurant (01273 476707) is heaven for gourmets of Indian cuisine. Late March – mid October. Head north from Lewes on the A275 and half a mile after leaving Cooksbridge turn right at The Rainbow Inn onto Deadmantree Hill. Follow the road for 2 miles to Holmansbridge Farm Shop. The campsite is the fourth turning on the right after the Farm Shop and shares the driveway with a house called ‘Woodside’. There are limited means of public transport direct to the site, although you can catch the bus to Barcombe from Lewes or from Cooksbridge, and then walk down the old railway track to Town Littleworth. Alternatively, you can get off the bus at the bottom of Deadmantree Hill at the start of Town Littleworth road. This is a 25 minute walk along a quiet country road to the campsite. Cooksbridge Train station is open during peak times on weekdays only. This is a 45 minute walk from the campsite or you can catch a bus from the site although they are very infrequent so worth planning in advance.